Andrea Modlash #13 (also known as Andrea Strip Lashes #13 Black) are full, spiky and long black false lashes. Most similar to Andrea ModLash #26. Brand new! Perfect for daily use. Natural style, with moderate to full length and volume. These lashes resemble Andrea #21 and Ardell #110 lashes, but with added volume and length. Brand new! Perfect for daily use. Natural style, with moderate graduated length and volume and accentuated corners. 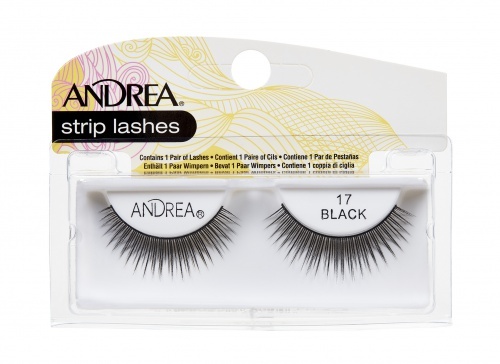 Andrea Strip Lashes Black #18 are dark and full length individually pattern falsies for a completely natural look. This style has an uniquely designed cut-out pattern for dramatically enhanced lashes ideal for every occasions. Andrea's new fantastic lash styles are individually patterened and designed to be perfectly shaped and arranged to give a striking effect.